When it comes to J-pop and J-rock, I'm very picky. There's a lot of stuff out there that just doesn't do it for me. Maybe part of the reason is that most rock/pop stars in Japan are also idols and TV or movie stars. They're watered down because they don't focus on their music. Now I'm sure the same charges can be leveled against many Western artists, but in most cases not the ones I like. People like David Bowie and Sting are the exception rather than the rule (and even they are a lot more well-known for their music than the movies they were in). 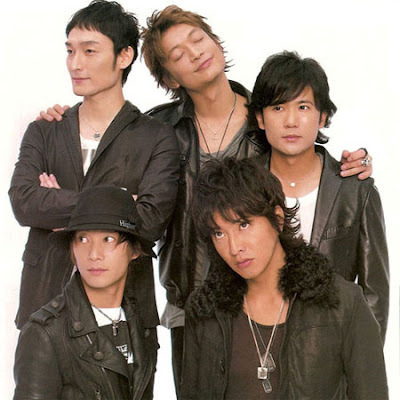 That's right, SMAP - stop singing and go make another poopy movie! Basically a lot of mainstream artists just strike me as toolboxes. That said, I do try to give Japanese artists a chance, and sometimes something will strike a chord with me for one reason or another. This time I wanted to share a music video by a band named Ikimono Gakari (いきものがかり). Some people translate their name into English as "Creature Clerk" or something to that effect, but I don't find that accurate enough. In Japanese, an ikimono is a living thing (or, yes, a creature), and a kakari (or gakari in some cases) is a clerk or caretaker. But an ikimono gakari, I believe, is a school child who is charged with the task of taking care of his or her class' wildlife - whatever pets or plants they may be keeping. Anyway, while Ikimono Garakri probably isn't a group I would listen to on my i-Pod, they do have some pretty rad music videos and the songs themselves aren't too bad either. Last year I came across a video of their's that features 8-bit video game graphics. Woot - right up my alley. Doesn't hurt that their vocalist is easy on the eyes, either, although that's a pretty standard feature of J-pop. So here's Ikimono Gakari's "Kimagure Romantic," which I figure to mean something like "Fickle Romantic"
Foreign music is always a bit of a puzzle for me... especially J-rock. It's seemingly huge mass appeal just falls flat with me. There's nothing I like past, "oh, well, that's interesting, I guess." I'm not that xenophobic, I promise. I love some Spanish music and German music. I've imported a few CDs or so of the German stuff (which Chris has rolled his eyes at!) Mostly stuff from the 90s, though. Love that crap, but it feeds my goth/industrial streak and I love the language. The video, though, I have to say... the moose gesture at the end? LOL, all I could think of was the annoying child's GAP commercials we had here during Christmas. Wow. You can find it on youtube and it will plague you forever!